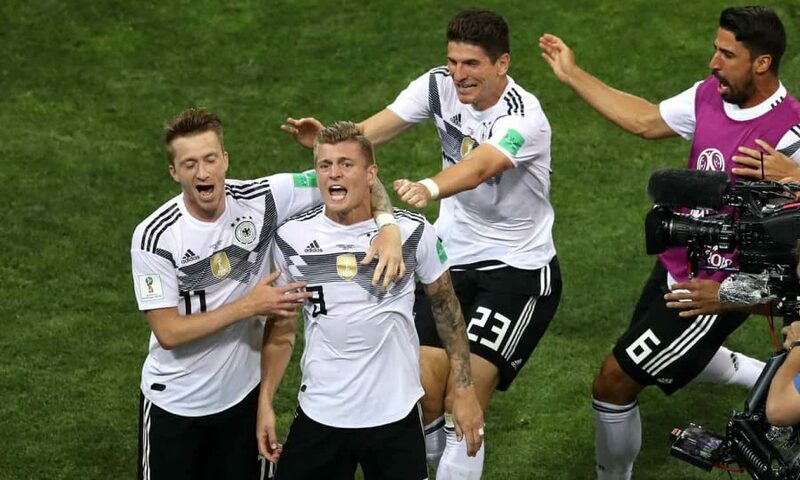 Germany’s (1-0-1) Toni Kroos scored a game-winning goal in stoppage time to cap a dramatic comeback against Group F foes Sweden (1-0-1) in Sochi. The win puts Kroos’ clan in contention for a place in the knockout round after losing to Mexico (El Tri) Sunday. Their match against South Korea (0-0-2) Wednesday will be a must win. Leading the group is El Tri (2-0-0) who eliminated the Koreans with a 2-1 win in Rostov-On-Don. The picture is set for Group F with one game remaining – Mexico or Sweden win and are in, with Germany also in contention. In Rostov, a well-taken first half Carlos Vela penalty gave El Tri a 1-0 advantage. Soon after, Javier “Chicharito” Hernandez doubled the lead in the second half through a lethal counter-attack. South Korea’s Heungmin Son scored a consolation goal in stoppage time. Hours later, Germany’s victory over Sweden kept the Germans alive. It was a heartbreaking moment in the 95th minute when Kroos’ free kick curled around goalkeeper Robin Olsen and into the net. Sweden did enough to secure at least a point but Germany’s stubborness in front of the net prevailed. In Group G, Belgium thrashed Tunisia 5-2 with a pair of goals from Romelu Lukaku and Eden Hazard. Michy Batshuayi made it five just before the whistle. Also in Group G are England and Iran who play Sunday. England will look to stay on pace with Belgium to set up a blockbuster between the two for the third match and the rights to win the group.